Growing up in the Iranian home of two educators provided Elahe Amani plenty of opportunities to learn she could be anything she wanted to be — and education would be the key. "Our home was not traditional as far as gender," remembers Amani, director of technology services in student affairs. "I was the first born in a family of six girls and one boy." "Traditionally, fathers send everything — furniture and everything for a home — with their daughters when they are married. My father's friends joked that he would have to declare bankruptcy because of all the daughters he had. But he answered that when we got married, the only thing we would be taking would be the education we received." That nontraditional background has given Amani the drive to help others who haven't been given the opportunities that she has received. Earlier this summer, Amani gave a video briefing on the issue of stoning to the United Nations Human Rights Council and has served on a global panel discussing the banning of the practice at a UN Commission on the Status of Women. She attends the commission meetings annually and spoken to the organization numerous times. Amani has been looking back at her life and the foundation she received from her parents. This year, she turned 60 years of age. "Events in my life have been interwoven with Iranian history. "Looking back, I can see just how forward looking my father was in those days. We were raised in a family culture that stressed higher education. I went to Tehran University, then the hub of student activism. I was socially engaged and served in the student government during the '70s, the Iranian version of the global '60s activism." The drive that propelled her then lives within her today. Her life and what she experienced, is what keeps her involved, especially with women's issues. "I've always had an eye on women's issues, although, I've never felt inferior because I was raised in a family culture that never said a woman was less than a man." Amani serves the needs of students on campus, but long before she came to CSUF, she was involved in issues of gender and culture, leadership and multiculturalism. In the community, Amani has organized statewide conferences and served as chair of the Coalition of Women from Asia and the Middle East. She has been a member of the board for the Women's Intercultural Network, a global organization based in San Francisco; served on the community advisory board for the Natural History Museum of Los Angeles, and a board member and representative on the California Women Agenda, as well as a research chair for the California State Economic Network. She also is a member of the American Association of University Women and the California Women in Higher Education. "What I do is very small but I feel that I have to do it. It's part of my life - not to get recognition, but because doing it is my very small contribution to educate the younger generation and make change possible, make life better. As said, change doesn't just happen. We collectively make it happen." Amani says firmly. "Everything I do is in that light." When she graduated from university, Amani stayed on at Tehran University. "In those days, if you had good grades, they would offer you a job to keep their top scholars. "They offered me a job in the school of law," she remembers. "Later, I got a scholarship (from Tehran University) to attend UCLA." Amani says she always wanted to explore the world. "I wanted to study in Japan and be an architect, but my Father said no — we didn't know anyone there." So when the opportunity to come to America came, she took advantage of the opportunity. And she knew someone here - the man that she would eventually marry. "We had known each other distantly but got to know each other better when I came to California," she explains. They married in this country and had a daughter before returning to Tehran in 1979. But they returned to a country that had gone through a revolution and was much different than what it was when they had been younger. "This was the first time that I felt that women were being pushed back," she says. "My mother had been a part of the generation who went to school without wearing hijab and she was a career woman. Seeing the changes, seeing women forced to step back ... That was transformative for me as a woman - as an Iranian woman. "I became focused. I read everything I could get my hands on," she says. And from what she was reading, she grasped the commonalities of what was happening to women all over the world. And then there was what was happening in Iran itself. "Iranian society was going through changes, mostly backward for women. There were mass upheavals, personally and politically. It was one of the darkest periods of my life. "When I returned here, I was determined I would be a voice for the voiceless," she says. "That notion stays crisp with me." She has been a whirlwind of action while still a parent and a wife. "My husband has always been very supportive," she says. "It's important to have family support on what you do. And it is important, challenging and rewarding both that you balance community, family and work." She attended her first UN Conference on Women in 1995, leading a workshop on "Women's Rights and Islam." 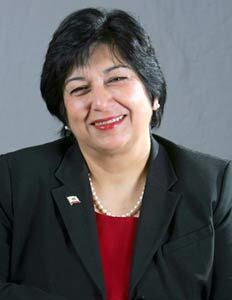 When she joined Cal State Fullerton in 1999, Amani continued to focus on women's issues and rights. "It was important to me to be active and contribute here on campus," she says today. "With the rise of extremism, the world presents many challenges for women. Many rights, who women before us fought hard for, are being placed on the table and can be compromised. We must educate younger women not to take things for granted and build strong partnerships between men and women for gender equality." Amani sees her work of serving students as a continuation of her more global efforts. "This is all one world to me. There is so much fluidity between all my roles," she says. "And, we all must keep moving forward." Note: This article originally appeared on the website of California State University, Fullerton and is reprinted with permission.